Vladimir Guerrero Jr. has been named the top prospect in baseball according to Baseball America in their top 100 list released Wednesday. It's the first time Baseball America has named a player from the Dominican Republic as the game's top prospect. Guerrero Jr. is one of seven Blue Jays on their top 100 list, with shortstop Bo Bichette sliding in at No. 8. Catcher Danny Jansen (42), pitchers Nate Pearson (70) and Eric Pardinho (84), third baseman Jordan Groshans (89) and Kevin Smith (91) round out the Jays' representation on Baseball America's list. Meanwhile, Atlanta Braves starter and Calgary native Mike Soroka checks in at No. 25. On last year's Baseball America list released in January, Ronald Acuna Jr. was named baseball's top prospect with Shohei Ohtani coming in second before Vlad Jr. at No. 3. Baseball Prospectus also released their top 101 list for 2019 Wednesday and had Guerrero Jr. in the top spot with Bichette occupying spot No. 12. In 95 games last season split between four different teams at varying levels in the minors, Guerrero Jr. had a .391 batting average, a .437 on-base percentage and a slugging percentage of .636 with 20 home runs and 78 RBIs. He also spent time in the Arizona Fall League with the Surprise Saguaros, hitting .351 and driving in 17 over 19 games. 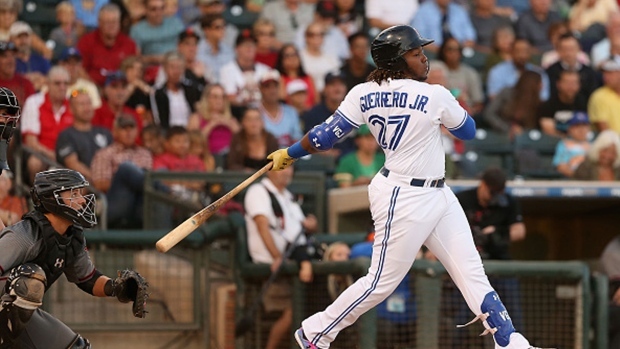 Guerrero Jr. was named minor league player of the year in 2018. Despite the 19-year-old's eye-popping numbers, the Jays haven't given a definitive timeline for when we could see him in action at the big league level. The Jays were criticized by the Major League Baseball Players Association for not calling him up last season. If the Jays wait until mid-April of the 2019 season to call up the phenom, they would gain an extra year of team control, taking him through 2025. Team president and CEO Mark Shapiro said last year that the decision to keep him on the junior circuit up was not based on business. "It has nothing to do with business," Shapiro told SiriusXM's MLB Network Radio in September. "It has nothing to do with anything other than we think the best thing for him developmentally is to go play in Arizona (in the fall league there) and continue to develop. "We think that when he gets here -- which would obviously not preclude him from making the team out of spring training next year, which would be evidence of that fact -- we think he's got a chance to be an impact player."